Exlar's Tritex Series actuators include a brushless servo motor, a servo amplifier, and a position controller in a single housing, resulting in a simple and cost-effective electric actuator alternative to fluid power actuators and more costly servo component systems. Electric actuators offer improved precision and lower maintenance compared to pneumatic and hydraulic power devices. Tritex actuators provide a simple replacement solution for existing ball screw or separate gear reducer mechanisms. The need for external servo amplifiers, cables, and extra panel space are eliminated by this simple and elegant solution. The servo amplifier is mounted within the actuator enclosure. However, where physical constraints or environmental conditions prohibit the mounting of the electronics on the actuator, Exlar offers the TRA500, which provides Tritex electronics in a remote enclosure. 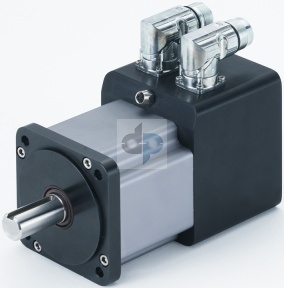 The Tritex rotary actuator features a rotatable shaft like that found in many electric motors. However, the rotational speed and position of the Tritex output shaft can be programmed in response to external commands. Input signals for triggering velocity and position presets may come through optically isolated inputs or through a Modbus serial communication channel. Output signals of the status and events provide the ability to coordinate the Tritex units with other system components. Internal gear reduction is available to provide gear ratios of 4:1 to 100:1, making the Tritex rotary actuators suitable for a wide range of applications. Tritex linear actuators feature Exlar's patented inverted roller screw technology for producing the linear motion, which traditionally required pneumatic or hydraulic cylinders. Exlar's linear actuators provide low-maintenance and high-precision replacement options for fluid power motion control components. The Tritex software may be programmed with predefined sequences of positions, speeds, and force levels. For example, reaching a predefined force level could trigger the reversal of the actuator, or the actuator could maintain a constant force until an external signal is received. The Tritex is compatible with analog command signals, providing an electric actuator solution for valve and damper control applications. The Tritex linear actuators operate on 24 to 48 VDC, with a 3-inch (76mm) frame size, with 3 to 18 inch (75 to 455mm) strokes available. * The dynamic load rating of zero backlash, preloaded screws is 63% of the dynamic load rating of the standard non-preloaded screws. The calculated travel life of a preloaded screw will be 25% of the calculated travel life of the same size and lead of a non-preloaded screw.